The average child or teenager attending school here in the United States considers it a great inconvenience if they have to wait an extra ten minutes in the rain the the school bus to arrive. But there are some schoolchildren who must endure much more just to get to their destination. 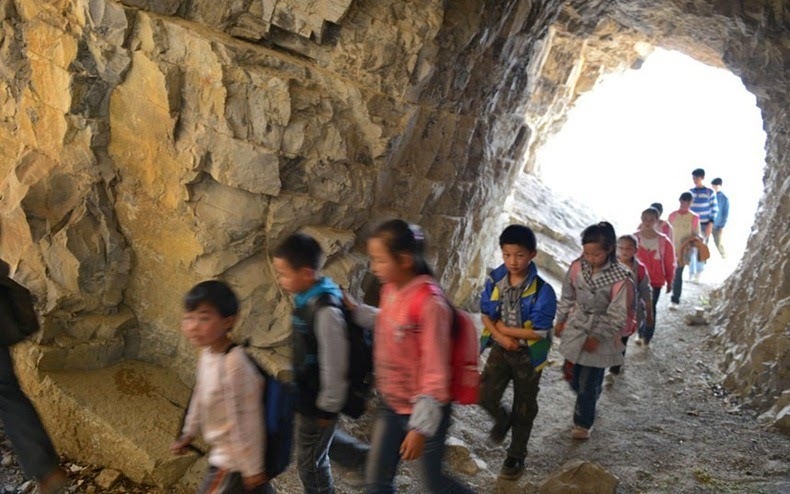 Take for example these 49 Chinese schoolchildren from the village of Genguan. Every single day they are forced to make a journey that is so perilous and taxing that it makes getting to school here in the United States look absurdly simple. 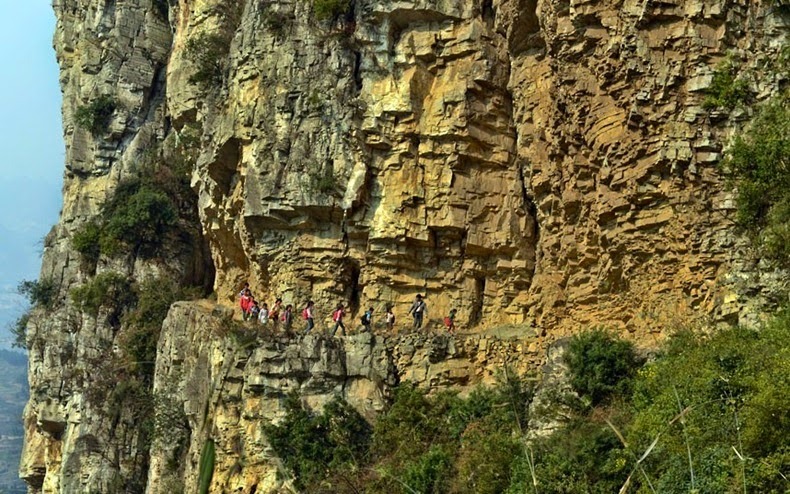 Each day these children walk along a treacherous path carved by the side of a cliff, as they gradually make their way to class in Bijie, located in southwest China’s Guizhou Province. Banpo Elementary School is situated halfway up a mountain and the path leading to it winds through dangerous hillside passes and tunnels carved out of the rock. The pebble-covered footpath is less than 0.5 meters in width, which forces the children to walk single file and press themselves into the side of the mountain if someone wants to pass them. In fact, this really was never meant to be a path at all; it was made 40 years ago and was supposed to be an irrigation ditch. By taking this way, the children have to spend two hours just trying to get to school. Naturally their parents worry about them, but the only reassurance they get is that the Headmaster Xu Liangfan travels with the children to school. While the story is shocking because it is so very awe inspiring, it isn’t uncommon for children from poorer regions to face such overwhelming difficulty on their way to school. It is truly amazing the great lengths some children will undertake in order to attend school.